Homes sales declined in February on a monthly basis, and continued to show declines year-over-year. Prices followed a similar pattern as the sales, posting a monthly decrease, however, prices remain well above the previous year’s levels. Inventory tightened slightly coming out of February and things have remained very tight with winter being the usual lowpoint for the year. However if inventory remains low moving into the warmer months, it could constrain home sales even further and cause larger price increases. 30-year rates remain below 4% but have begun to trend back upward after dropping in the second half of last year amid concerns around the global economy. 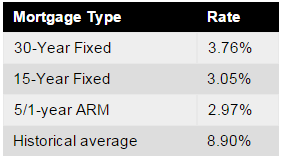 Currently, Freddie Mac reports the following figures: 30-year fixed rate, 3.76%; 15-year fixed rate, 3.05%; 5/1-year adjustable rate, 2.97%. The seasonally adjusted annualized rate of Queens home sales declined from January to February to a pace of 564 homes, a 3.3% decline. Queens home sales were 1.4% lower than the same month of the previous year, with February making eleven months in a row of year-over-year decreases. Residential home sales are up 6.4%, Condo sales are down 31.1%, and Coop sales are down 3.7% from the same time last year. The median home price for Queens reported by the Long Island Board of Realtors declined 4.7% in February to $405,000. 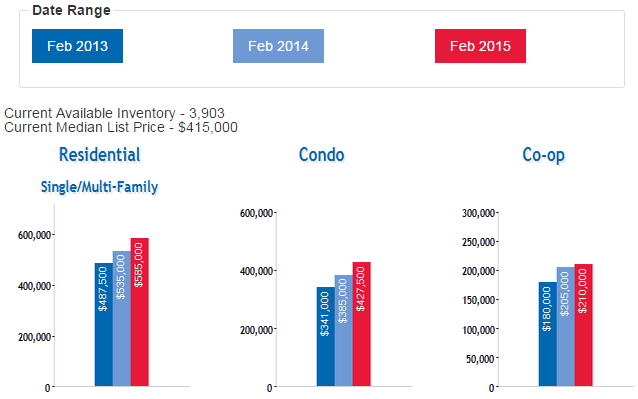 Queens Home Prices, however, remain 9.6% higher than the same month of the previous year. 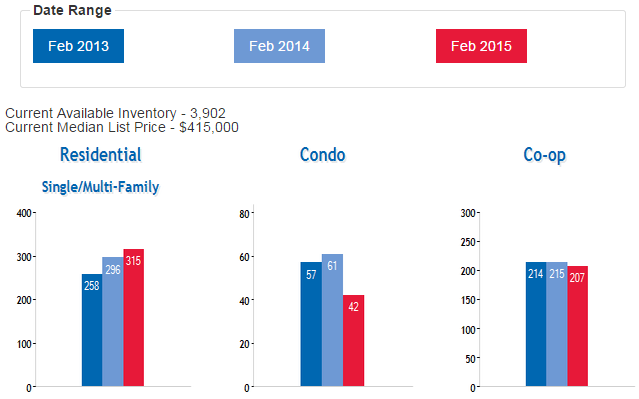 The consistent rise in year-over-year price growth is probably due to low inventory levels in the last 12+ months. Residential home prices are up 9.3%, Condo home prices are up 11%, and Coop prices are up 2.4% from this time last year. The number of homes available decreased 27% compared to the same month of the previous year, with 3,902 Queens’ homes available for sale in February. This translated to 5.7 months of supply. Inventory will likely remain low during the cooler months of the year and then loosen as the weather warms. Still Inventory levels are extremely low, and the low inventory is continuing to drive price increases across the county. With the Spring market right around the corner, we may see a large amount of pent up demand hit the market soon, otherwise, we will likely see the same market conditions persist for most of the year.